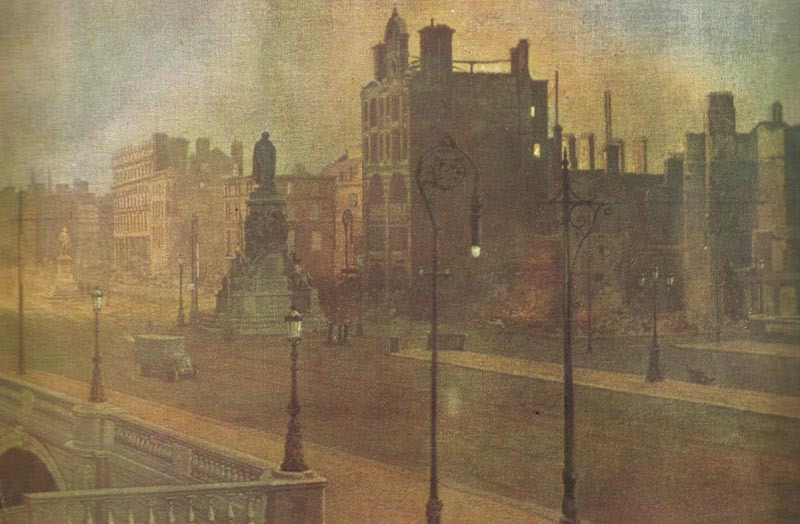 O’Connell Street with the destroyed Liberty Hall in Dublin after the British bombardment. The Irish rebells imagined first the British would not shell their own property. Irish Sea: British gunboat Helga destroys Liberty Hall, Dublin during Easter Rising. Mesopotamia, Kut: After Kitchener cable authorizes talks, Townshend letter asks for 6-day armistice and 10 days food while surrender agreed. Garrison starts destroying anything of value. Eastern Front: Zeppelin SL7 raids Dünamunde (Wenden on April 28) and German planes Dvinsk (Zeppelin LZ86 raids its railways on April 28 and Rieshiza on April 27). Germany: Anglo-German PoW exchange via Switzerland signed in Berlin (signed in London on May 13).